Memoir, intercontinental cycling adventure, music guide, Cadence is the debut book by ABC Classic FM's Emma Ayres. Accompanied by Vita, her steadfast bicycle, and her violin, Aurelia, Emma Ayres cycles her way from England to Hong Kong. It is a book of questions too: How does the instrument you play reveal who you are as a person? Should you tell the serious Pakistani chap who has just welcomed you into the men's quarters of his house that you're not quite who he thinks you are...? Provocative, intelligent, surprising and funny, Cadence is a delight from one of Australia's best-loved broadcasters. Emma Ayres, now Eddie Ayres, is a classically trained musician, writer, teacher and trans man. Before Eddie transitioned to male, he was for many years a viola player with the Hong Kong Philharmonic. In 1999 Eddie cycled from Shropshire in England to Hong Kong, for charity. The nine-month solo trip allowed for a lot of thinking-time and led Eddie to decide two things: learn the cello, and try his hand at radio. He moved to Australia and joined ABC Classic FM in 2004. Eddie now teaches string instruments in Brisbane. Wonderful read! I could hear Emma's voice and sense of humour throughout. I am still astounded by her courage and conviction in attempting the journey, but a wonderful finish. Her joy of music is infectious. I was disappointed that she didn't continue with the cello but realised that her real love is the viola and, having had the chance to hear her play, I am sure she made the right decision. She has a wonderful ability to make music come alive and I hope she continues to have many more opportunities to do this. I would highly recommend the book. Set in the world of classical music yet, a travel book. A recounting of a most fabulous trip. Not the boring style many travel books use. No, a fresh, honest and exciting style. Emma has shared an amazing journey in such a unique way that I gained a greater appreciation of music as well as learned of her travels. She shares this in a way that it would be related in a conversation rather than a chronological travel journal. This makes for relaxed easy reading. wonderful book! I wish I had read it with the CD that is available. I need to track down the CD and re-read it. Really delightful book. 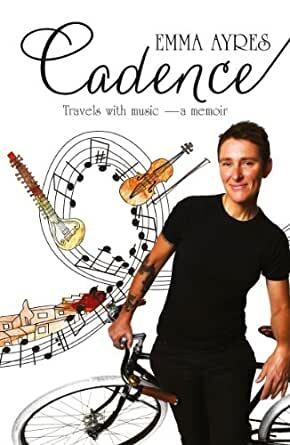 An interesting account of a remarkable woman, her adventures in music and in her long bike ride from London to Hong Kong in which she experienced friendship and support in many places the reader would least expect. This is one of those books that you read because of the authors profile as a broadcaster who has gathered a substantial following. It turned out to be the most enjoyable read and the best I have read this year. I thoroughly enjoyed this book. It was so well written and made me feel like I wanted to start playing another instrument! Just lovely. How to figure out your life: Hop on a bike in London and keep going until you reach Hong Kong. Carry a violin on your back, and play it often. That still leaves a lot of time to think about music and life.